I am an accomplished and experienced Bar and Bat Mitzvah tutor, having taught b’nai mitzvah, at home and abroad, during the school year and at summer camp, for over 30 years. First of all, when your child learns with me, he or she receives a bonus: a one-on-one, Ordained Rabbi with whom the child can discuss any topic about Judaism and its origins, practice, relevance, etc. This is a one-of-a-kind opportunity. Second, my system for tutoring has been refined over the course of years, again and again — by me, YOUR RABBI, and not canned out of a box of generic software. It is designed to help your child achieve success, while catering to the individual needs of YOUR CHILD and situation. It is created specifically for YOUR CHILD alone. Thus, the voice YOUR CHILD hears on the recorded Bar/Bat Mitzvah media is MY VOICE, and not some anonymous and disembodied one, recorded by someone in a studio in a faraway shtetl. I am YOURS, and my expertise is YOURS. I record each and every student’s material on site in front of YOUR CHILD. The recording? Over the course of time, the original idea of tape recordings have given way to CDs, i-pods, and smart-phone media recording. Please note: In our fast-paced world, it is often difficult for a family to present the student physically at the tutor’s home for lessons. Therefore, ONLINE, DISTANCE LEARNING INSTRUCTION IS AVAILABLE. Internet and Skype, among other programs, have made the virtual into the reality — even with Bar and Bat Mitzvah study. Consider me your cyber-rabbi! Yes, the media have changed, but the expert and expertise behind that recording remains the same — me, YOUR RABBI. 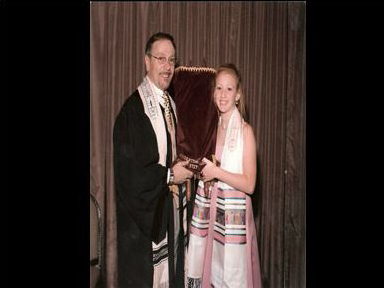 Third, my Bar and Bat Mitzvah Services are designed to focus on YOUR CHILD as the center of attention around which the Bar or Bat Mitzvah ceremony itself is built. There is no long Congregational Service of some three hours’ duration, of which your child’s portion forms but 10 short minutes. Rather, the short, hour-long service insures that YOUR CHILD is the main focus. As rabbi, I am the frame around YOUR CHILD and his or her achievement — Torah, Haftorah, Speech, etc. When you engage a private Bar/Bat Mitzvah Rabbi, you have a personal and personalized experience, from start to finish. And I am YOUR RABBI.